"Kissimmee" redirects here. For other uses, see Kissimmee (disambiguation). Motto: "A community of neighborhoods for families!" Kissimmee (/kᵻˈsɪmiː/ kə-SIM-ee) is a city in Osceola County, Florida, United States. As of the 2010 United States Census, the population was 59,682. It is the county seat of Osceola County. Kissimmee is a Principal City of the Orlando-Kissimmee-Sanford, Florida, Metropolitan Statistical Area, which had a 2010 population of 2,134,411. 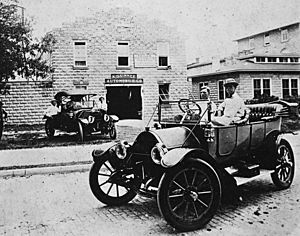 The area was originally named Allendale, after Confederate Major J. H. Allen who operated the first cargo steamboat along the Kissimmee River – the Mary Belle. 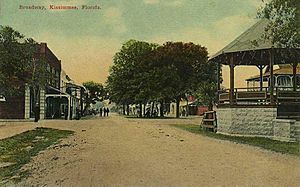 It was renamed Kissimmee when incorporated as a city in 1883. The etymology of the name Kissimmee is debated, apart from general agreement that it is Native American in origin. Its growth can be credited to Hamilton Disston of Philadelphia, who based his four-million acre (8,000 km2) drainage operation out of the small town. Disston had contracted with the financially wobbly state of Florida to drain its southern lands, for which he would own half of all he successfully drained. This deal made Disston the largest single landowner in the United States. Kissimmee had a population of 4,310 in 1950. At that point there was some citrus packing as well as the ranching. Ranching remained an important part of the local economy until the opening of nearby Walt Disney World in 1971. After that, tourism and development supplanted cattle ranching to a large measure. However, even though the Disney facility took over much of the open range cattle lands, cattle ranches still operate nearby, particularly in the southern part of Osceola County. On August 13, 2004, Hurricane Charley passed through Kissimmee with winds in excess of 100 miles per hour, damaging homes and buildings, toppling trees and cutting electrical power to the entire city. Kissimmee Utility Authority restored power to 54 percent of the residents in the first 72 hours; 85 percent were restored within one week. Service was restored to all customers on August 28. Three weeks after Hurricane Charley, the area was struck by Hurricane Frances, followed by Hurricane Jeanne three weeks after Frances. Kissimmee is located at (28.303988, -81.412867). According to the United States Census Bureau, the city has a total area of 17.32 square miles (44.9 km2), of which 16.7 square miles (43 km2) is land and 0.6 square miles (2 km2) is water (3.7%). 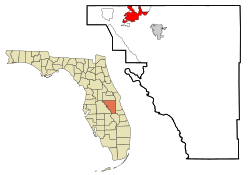 Kissimmee and the city of St. Cloud are the only incorporated settlements in the county. The cities lie in proximity to each other along U.S. Highways 192 and 441. A large geographical area of unincorporated Osceola County also refers to their area as Kissimmee. This includes most of the 192 corridor west of the city border to Highway 27, areas north of the city to Hunters Creek, and areas south of the city to Poinciana. Drained by the Kissimmee River, the city is situated on the northwest shore of Lake Tohopekaliga (locally called Lake Toho, West Lake Toho, or simply West Lake) in central Florida. Shingle Creek, largely considered the headwaters of the Everglades, also runs through the city. Shingle Creek features a popular canoe/kayak trail that runs from Steffe Landing on US 192 and ends in Lake Tohopekaliga. The downtown area lies near the intersection of U.S. Highway 17/92 and U.S. Highway 192. 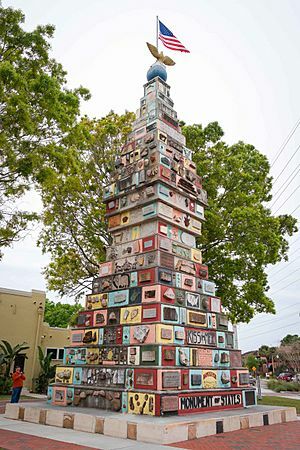 The downtown of Kissimmee does not possess any big skyscrapers; most of the buildings are two or three stories high. The biggest and the tallest building in the downtown is the Osceola County courthouse. The main thoroughfare follows along Highway 17/Highway 92 through the city's center and is a combination of three streets: Main Street, Broadway Street, and Emmett Street. The downtown area consists largely of restaurants, small shops, and historic residences. 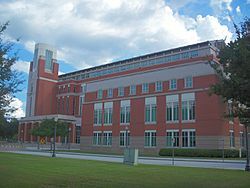 The University of Central Florida has a business incubator located in the area that is an important part of the economic engine downtown. In the 2010 census, Kissimmee had a population of 59,682. The racial and ethnic composition was 58.9% Hispanic (33.1% Puerto Rican, 5.1% Dominican, 4.0% Colombian, 3.9% Mexican, 2.6% Cuban, 1.4% Venezuelan, 0.9% Ecuadorian, 0.7% Salvadoran, 0.7% Peruvian, 0.6% Honduran, 0.6% Nicaraguan) or Latino, 26.2% non-Hispanic White, 9.6% non-Hispanic African American, 2.8% Hispanic black, 0.6% Native American, 3.4% Asian (1.1% Asian Indian, 0.8% Filipino), 0.1% Pacific Islander, 0.4% Non-Hispanic from some other race and 4.7% two or more races. Compared to the previous census of 2000, there were 47,814 people, 17,121 households, and 11,813 families residing in the city. The population density was 2,866.6 per square mile (1,106.8/km2). There were 19,642 housing units at an average density of 1,177.6 per square mile (454.7/km2). The racial makeup of the city was 67.22% White, 9.99% African American, 0.52% Native American, 3.38% Asian, 0.10% Pacific Islander, 14.15% from other races, and 4.66% from two or more races. Hispanic or Latino of any race were 41.73% of the population. The majority of Hispanics residing in the city are Puerto Ricans. There are also small Colombian, Cuban, Dominican and Mexican communities residing in and/or around the city. There were 17,121 households out of which 37.4% had children under the age of 18 living with them, 47.2% were married couples living together, 15.8% had a female householder with no husband present, and 31.0% were non-families. 20.9% of all households were made up of individuals and 4.9% had someone living alone who was 65 years of age or older. The average household size was 2.77 and the average family size was 3.21. In the city, the population was spread out with 27.0% under the age of 18, 12.0% from 18 to 24, 34.9% from 25 to 44, 18.5% from 45 to 64, and 7.6% who were 65 years of age or older. The median age was 31 years. For every 100 females there were 98.1 males. For every 100 females age 18 and over, there were 95.8 males. The median income for a household in the city was $33,949, and the median income for a family was $36,361. Males had a median income of $25,851 versus $21,025 for females. The per capita income for the city was $15,071. About 12.3% of families and 15.4% of the population were below the poverty line, including 19.0% of those under age 18 and 10.2% of those age 65 or over. Kissimmee features a Multi Modal Transportation Hub located between Neptune Road and Monument Streets. This hub includes the Amtrak train station, which will be a station stop on the SunRail commuter rail system. There is also a Greyhound bus station. The hub also features a bus terminal providing service by the Lynx network. Kissimmee Gateway Airport has four fixed-based operators that provide service to the area. Kissimmee Gateway Airport (ISM) accommodates general aviation air service 24 hours a day with two paved airport runways—respectively 5,000 and 6,000 feet. There are also two flight training schools, and a museum at the airport. Orlando International Airport can be reached from Kissimmee in 15 minutes by car. The major land transportation arteries are the Florida's Turnpike, Interstate 4, Osceola Parkway, and US 192. Among other important routes are US 17/92 that join with US 441 into the Orange Blossom Trail (OBT) and State Route 423 also known as the John Young Parkway. Old Osceola Courthouse – Oldest continually operating courthouse in state. Jungle land zoo. The world's second largest Aligator was demolished as of late 2014. Building still for sale. Kissimmee Lakefront Park – A $20 million public works project. Twin Oaks Conservation Area – A popular place with locals for sunset. Scotty's Landing – A canoe launch/landing featuring an educational area and exercise trail. The Shingle Creek Regional Trail (SCRT) is an inter-governmental project that will eventually connect Kissimmee to Orlando through a 32-mile bicycle trail. It runs along the environmentally sensitive Shingle Creek, and was included on President Obama's America's Great Outdoors list. Various parts of the trail are currently open, with many parts to be completed by 2016. It will be 12 feet wide, composed variously of bridges and paved roadway, and travel through mostly undeveloped area. Kissimmee is home to a number of golf courses and mini-golf courses. Kissimmee is also home to the Loop, a large outdoor shopping mall at John Young and Osceola Parkways on the Orange/Osceola County line. It features stores such as American Eagle, Kohls, and Best Buy. There is also a multi-plex theater. Kissimmee also features a unique transformation of the former Osceola Square Mall into a Spanish-style marketplace called Plaza Del Sol. Kissimmee is near Orlando, home to Universal Orlando Resort and SeaWorld, and Lake Buena Vista/Bay Lake Walt Disney World Resort, allowing tourists to access the parks through the city. The climate in this area is characterized by hot, humid summers and generally mild to cool winters. According to the Köppen Climate Classification system, Kissimmee has a humid subtropical climate, abbreviated "Cfa" on climate maps. Osceola County Stadium with Johnson University Florida in the background. Kissimmee, Florida Facts for Kids. Kiddle Encyclopedia.